Historian William Wander will present a free public lecture on The Tompkins Market, a predecessor to the building that now stands at 41 Cooper Square. RSVP required. See details at bottom. 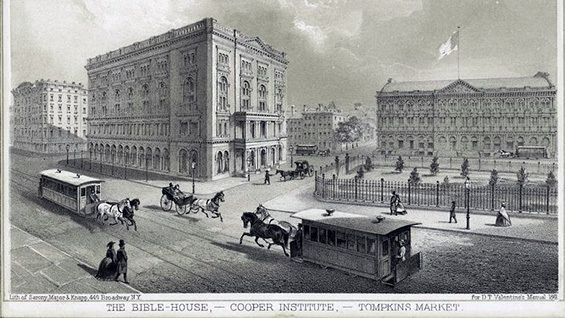 The Tompkins Market stood on the small city block bounded by Sixth Street, Seventh Street, Hall Place and Third Avenue, where the newest Cooper Union building 41 Cooper Square, now stands. The first Tompkins Market opened here in 1830, but the most famous was the 1860 cast iron building designed by James Bogardus. This building contained the public market on the first floor, and the armory and drill rooms of the Seventh Regiment of the New York State National Guard on the second and third floors – an unusual combination in the 19th century or today. The public markets were the place where the best meat and fish, butter, milk, and cheese, the freshest vegetables, fruits in season and "exotic fruits" - bananas and grapefruit - could be found. The inventory of the 1860's market would astound the shopper of today. In 1880, the Seventh Regiment moved out to their own armory, the Fighting Sixty-Ninth Regiment moved in, and stayed another 26 years. This landmark building stood for just over fifty years, before the market system faded from relevance. Torn down to make way for an expanding Cooper Union, it is all but forgotten - a simple but majestic, utilitarian, and once imposing presence at the end of the Bowery. Co-sponsored by The Cooper Union and The Greenwich Village Society for Historic Preservation.